These are unpolished slabs of Imperial Jasper from Mexico. We charge one shipping cost for all that will safely fit in a Small Priority Flat Rate box and will ship to the U.S. as well as Internationally. First Class shipping available on request when weight permits. See our Store Policies for full details. 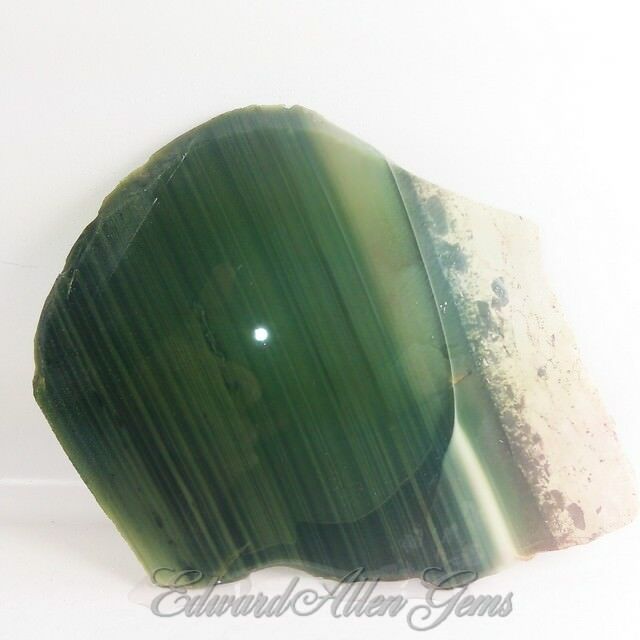 This dark green Imperial Jasper slab has wonderful translucence when light is placed from behind it - a quality we're more used to with Jade, and not so much with Imperial Jasper. It is roughly 4 1/2" x 4 1/2" at its widest points, and 4.6 to 5 mm thick. It weighs 123.5 grams, or 4.3 ounces. While there is plenty of room with this one for some beautiful stones to be cut, please notice the 'gash' on one side, visible in several photos. You will need to work around that. The white dot in the main photos is just a reflected light spot. Here is another wildly-colored slice of Imperial Jasper! It's like the 'artist' just took paint and threw it across the pallet. There is a hint of orb patterns in it, though very light. It is roughly 3" x 2 3/8" and 7-8 mm thick. It weighs 64.3 grams, or 2.3 ounces. It has a few fractures to contend with if cabbing. First Class Shipping for less available upon request. Here is another Imperial Jasper slice, with just a very slight hint of an egg pattern in it. It has a couple of fracture lines, but feels like a nice, solid slab. It is roughly 3" x 2 1/2" and 6 mm thick. It weighs 63 grams, or 2.2 ounces. First Class Shipping for less available upon request.